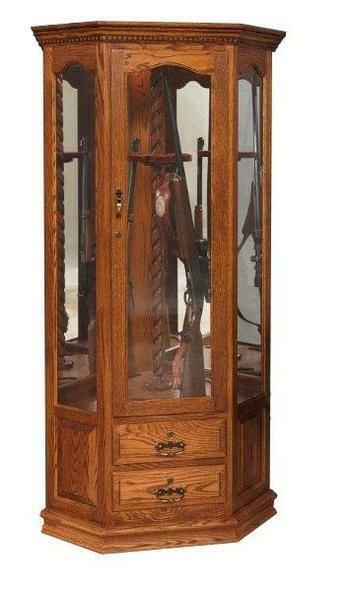 Access your rifle collection in seconds with help from the convenient rotating gun carousel inside this unique Mt. Eaton Corner Swivel Six Gun Cabinet. This amazing piece of solid wood Amish furniture is a great way to store and display your rifles. This is not meant to be a "gun safe" and will not keep your firearms from being stolen, but it does come standard with locks on all the doors to restrict access and keep unauthorized individuals from handling your rifles. This is especially important if there are children around. The doors should be locked at all times and weapons should be stored unloaded with ammunition stored in a separate location. The bottom two drawers is a great place to store firearm accessories, hand guns, and ammunition. Personalize your new Mt. Eaton Six Gun Corner Swivel Cabinet today with our selection of optional features that will let you turn this stunning gun cabinet into your own. Call toll free today for additional information at 866-272-6773.